Welcome, Vanitha. I wanted to let you know how much I enjoyed reading Watermark and how happy I am to be working with you on this blog and your featured author week. Can you tell us what your debut novel, WATERMARK, is about? Certainly. I’d like to thank you for this great opportunity; I’m happy to be here! Watermark is the story of how Auda, a mute girl kept away from the rest of society finds her voice through writing poetry on her father’s paper. As Auda searches for her place in the world, she meets some powerful, and often dangerous people: the town’s rulers, the Archbishop, a group of heretics, and a mysterious young artist who captures her heart. In looking for a way to express her own voice, Auda must figure out who and what is important to her, and what she is willing to fight for. However, Watermark is also the story of paper itself and how it found a place in Western society. What made you decide to write a novel about papermaking? Paper has always fascinated me, even when I was a child. A blank sheet of paper offers so many possibilities for storytelling. My search for the story behind papermaking focused primarily on its spread during the Middle Ages. Papermaking was introduced to Europe, through Spain, at a time when the Catholic Church had a stranglehold on the masses. They were largely seen to be corrupt, but they controlled the parchment supply, and thus could control the flow of information. But then here comes paper, which was far more affordable than parchment and offered the general populace a cheap means to pass along their ideas to a larger audience. This scared the church and nobility—the idea of a literate public was a frightening thing. Of course, the inclusion of paper in common culture had a variety of other effects, such as the move from oral to written storytelling, which in turn led to books that were not only didactic but could be written and read for fun! The title Watermark is very intriguing. Can you tell us why you chose it? The idea of watermarks plays a central role in the story. Like the colophon of a book, or the brand of a leatherworker, watermarks were used to identify who made a sheet of paper, what studio or mill it came from. It’s been hypothesized that watermarks were used for one papermaker to identify another as like-minded in thought and philosophy. And of course, Auda herself is marked by water—she is named for the river Aude, which had a huge presence in her life. Other reviewers have commented on the tremendous detail in Watermark. Can you comment on the research that went into writing the book? For me, the beauty of historical fiction comes from the way you can immerse yourself in a different world, learning new things as you experience them in the story. I have a strong logical side as well as a thriving creative side, so blending both talents made writing this book so much fun. My research took about four years or so and ranged from traditional book study, more adventurous efforts such as making paper on the balcony of my apartment using medieval techniques, to taking a trip to southern France in order to get a detailed sense of the time and place. I am reminded of a question I received early in my writing career: You talk about a vendor selling meat pies—how does he keep them hot? I thought: Well, I don’t know but I’m certainly going to find out! I do have to say that in order for me to feel immersed in a scene, I have to write tons of description so I can keep setting and blocking straight. Not all of that makes it into the final work, but where possible, I try to paint a vivid picture for the reader. What makes this a book that people MUST read? The introduction of paper in Western society was the start of an inquisition by the people: who was telling them how to live, what to believe, how to act, and really, did they deserve that position of power? Society today is experiencing a similar upheaval. Anyone who has access to a computer can now reach out to a worldwide audience. Much like in our medieval past, there is a frenzy of excitement about the leveling of the playing field. And as the reader, we now have a world full of voices clamoring for our attention. As in times past, we now have to look at the criteria we use to judge the worth of a communication, whether we accept it as truth or distrust the message and the messenger. Of course, I also think the story of Watermark is compelling in its own right, with characters that are multi-faceted and issues that are not easily soluble. My current work-in-progress takes place about a hundred and fifty years after Watermark and is set in the city of Venice. Under the working title, The Golden Book, the story concerns the use of the printing press to promote Humanism, a philosophy that was hotly debated during the Renaissance. While the Church has little influence in the city at this time, Venice’s dreaded Council of Ten keeps an eye on all of its citizens, and takes action where it will. Can you tell us where to find more information about you and how readers can reach you? You can visit me at my website, www.vanithasankaran.com, where you’ll find an excerpt from Watermark, links to reviews of the book, and news about upcoming appearances. 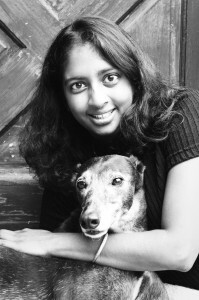 Readers can contact me via email at info@vanithasankaran.com and find me on Facebook and Twitter (@Vanitha_S). I am also happy to appear at local book group discussions or to participate virtually via Skype or telephone. Please do contact me—I love to hear from my readers! Thank you again for hosting me. The comparison to the computer is so right on. The period of this novel was one of great upheaval and the church really was doing everything it could to hold onto power. Power meant money of course!